Shalia is a proud daughter of the desert, but after years of war with the adjoining kingdom, her people are desperate to end the violence. Willing to trade her freedom for peace, Shalia becomes Queen of the Bone Lands, a country where magic is outlawed and the Elementae - those that can control earth, air, fire, and water - are traitors subject to torture...or worse. Before she is even crowned, Shalia discovers that she can bend the earth to her will. Trapped between her husband's irrational hatred of the Elementae and a dangerous rebellion led by her own brother, Shalia's only chance to survive is to harness her power and make an impossible choice: save her family, save the Elementae, or save herself. An arranged marriage to save her family's lives is not the stage for a successful relationship. But that is the position Shalia finds herself in when Reign the Earth opens. While her new husband is not hideous, he's also not what she had hoped for in her heart. Immersed in culture shock, she faces another hurdle when her own magical abilities begin to emerge. Knowing she must hide those powers from her new husband for her own safety, she finds herself in the middle of a rebellion, stuck between the marriage she agreed to and her true feelings. A further complication is the fact that her new husband's brother is too available and easy for her to talk to. As her feelings for her brother-in-law grow, her husband's irrational hatred of her people also grows. It soon becomes obvious that Shalia can't hide her powers (or her feelings) any longer. 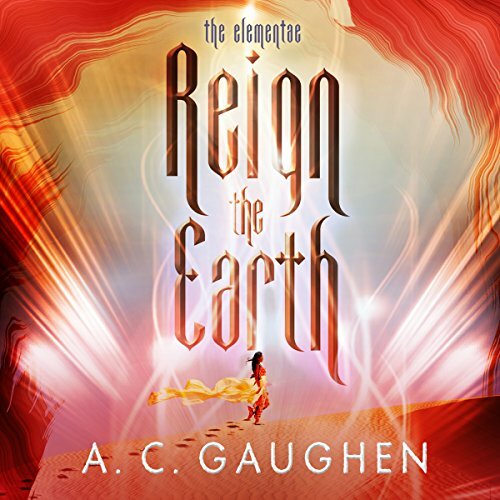 I really enjoyed this book by A.C. Gaughen. Fast paced and filled with adventure and danger, it was an easy read and a nice opening book to a new series. I'll be looking for the next book when it is released. Wonderfully imagined and richly detailed this adventure left me rooting for the protagonist on every page. Full of twists and turns and just enough magic, this is storytelling at its finest! I love this book! I'm so happy it is a series! I'm so looking forward to the next book! This is one of the best audio books I have had the pleasure of listening to! It is so beautiful and captivating. You won’t want to stop listening! 10/10 recommend!